It is important to point out that you should never be paying more on your medical plan than what is absolutely necessary. If you do this, then you are simply throwing money out the window. 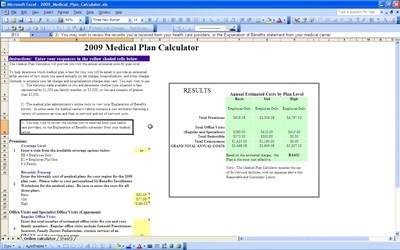 Instead, you need to select a good plan for your employees and use the medical plan calculator that you can find on your excel program in order to figure out how much you are going to have to spend. Some would even suggest that you go ahead and do this ahead of time so that you can actually figure out the true cost of the plan that you are considering before you ever make the purchase of it in the first place.